Located only 1,500 feet from the active Calaveras fault line in Santa Clara County, Calif., the Calaveras Dam could be in serious trouble if an earthquake were to hit. That’s why officials from the San Francisco Public Utilities Commission (SFPUC) lowered the water level of the Calaveras reservoir to less than 30 percent of its original volume in 2001 due to seismic concerns. But that reduction came at a price. Calaveras Reservoir, impounded by Calaveras Dam, is the SFPUC’s largest drinking water reservoir in the local Bay Area. When it is full, it provides more than half of the Bay Area storage capacity for 2.6 million customers. The water supply is crucial during emergencies and times of drought, and with California in its fourth year of a record-breaking drought, the water is badly needed. The SFPUC was faced with an ultimatum: safety, or water? The bridge allows crews easy access to either side of the spillway. The walls are 40 feet high. They decided on both. The Calaveras Dam Replacement project began in 2011 as an effort to rebuild the existing dam to make it seismically safe. Upon completion of the $810 million in 2019, the Calaveras Reservoir will be back to its original storage capacity of 96,850 acre feet of water, or 31 billion gallons. The Calaveras Dam Replacement Project is the largest project of the $4.8 billion Water System Improvement Program (WSIP) to repair, replace, and seismically upgrade key components of the Hetch Hetchy Regional Water System. Workers prepare the underlying foundation of the spillway for the concrete slabs. Crews could only place concrete at early hours of the morning, during cooler temperatures. 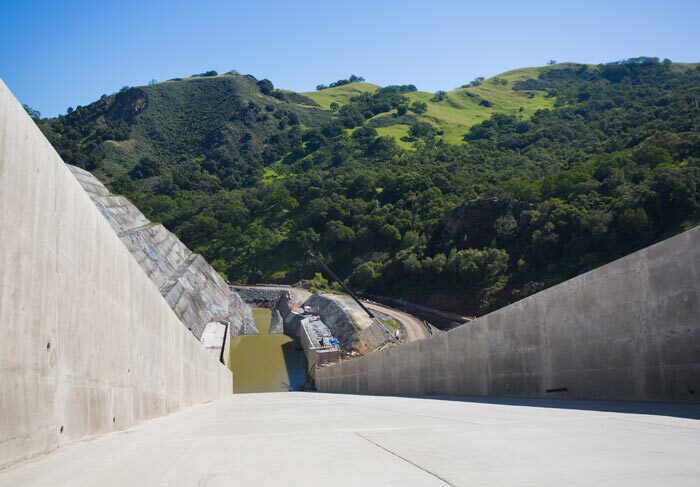 In April of 2016, a major milestone was hit: completion of the spillway, an important safety structure of the dam that leads from the reservoir to the Calaveras Creek below. The spillway is used to control excess water flow in the reservoir by releasing it into the spillway, where it then travels to the creek. 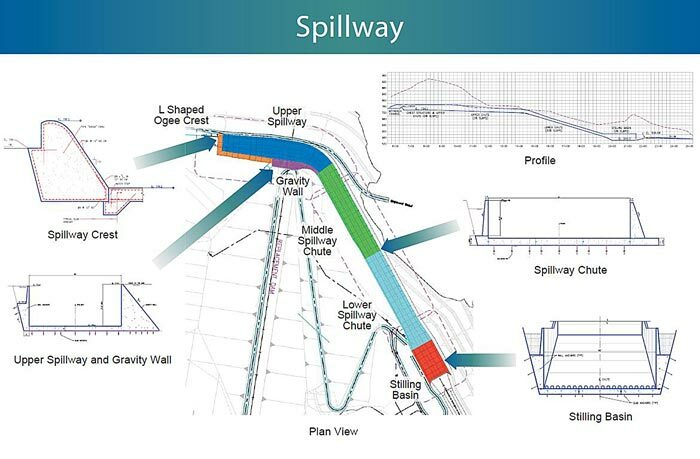 The design of the spillway consists of three parts: the upper spillway, the spillway chute, and the stilling basin. According to Harlan L. Kelly Jr., the General Manager of the SFPUC, “the spillway is the width of an 8- lane freeway. Tens of thousands of hours of work went into its construction,” he says. Pictures may be deceiving, making the spillway appear smaller than it actually is, but the spillway’s walls are 40 feet high. 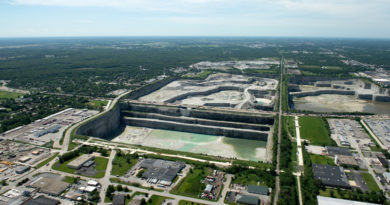 In total, 50,000 cubic yards of concrete were used to build the spillway, which is 1,550 feet long. The project team built the spillway in three sections: the upper spillway, which collects flood water from the reservoir, the spillway chute, which is a 30% downhill slope, and the stilling basin, which slows the water flow before it is released into the creek. The spillway could not be built as a conventional linear structure due to the shape of the valley, making construction more challenging. As such, the spillway has a horizontal curve to minimize excavation into the steep left abutment hillside. The stilling basin at the bottom of the chute dissipates the energy of flow down the spillway chute to reduce its erosion potential, and protect the flora and fauna in the fragile ecosystem, before being released to Calaveras Creek. 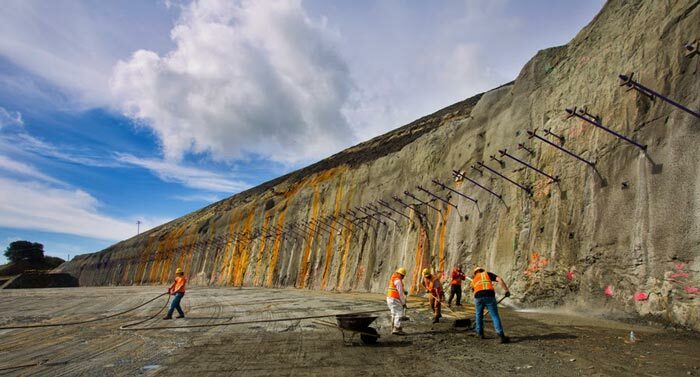 In order to prevent damage to the structure of the spillway during an earthquake, 1,825 solid steel rods were drilled 25 feet into the rock around the spillway, effectively anchoring the structure into the side of the hill. 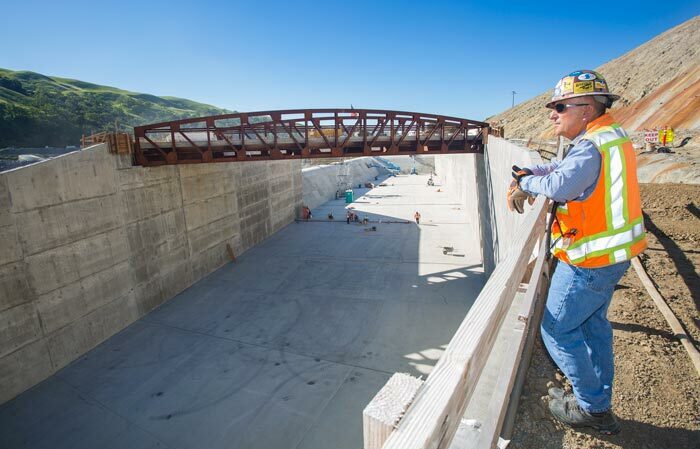 Field Operations Supervisor John Rocca looks out over the spillway’s progress. Crews had to build a bridge across the spillway in order to be able to access it while finishing construction on the rest of the dam. In an incredible time lapse video on the SFPUC’s YouTube Channel, you can see crews move over seven million cubic feet of rock soil, along with the construction of the spillway, in the span of two minutes. The time lapse makes the work seem effortless, but the project team faced difficult construction challenges along the way. Concrete placement on the spillway had to be done in the early morning hours because cooler temperatures were necessary for the concrete to set properly. Crews of laborers and concrete finishers would have a start time of 2 a.m. and work on placing 120-400 cubic yards of concrete before the temperature got too high. Crews also encountered different site conditions due to the geotechnical foundation conditions that affected the spillway and dam. In 2012, during excavation work, crews discovered ancient landslides in the spillway and dam foundation. Since the rock and soil material in these landslide masses was not suited to be in the foundation, it had to be removed and the area was backfilled with concrete, so it could be stable enough for the foundation of the spillway. The spillway is 1,550 feet long. Its walls are 40 feet high and it is the width of an eight lane freeway – around 60 to 80 feet. 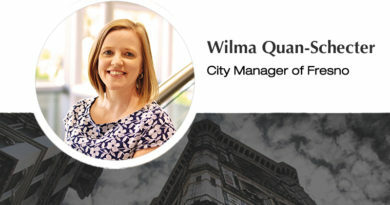 Although the difficult geologic conditions led to increased costs and schedule impacts, the project team worked to minimize the impacts as much as possible. 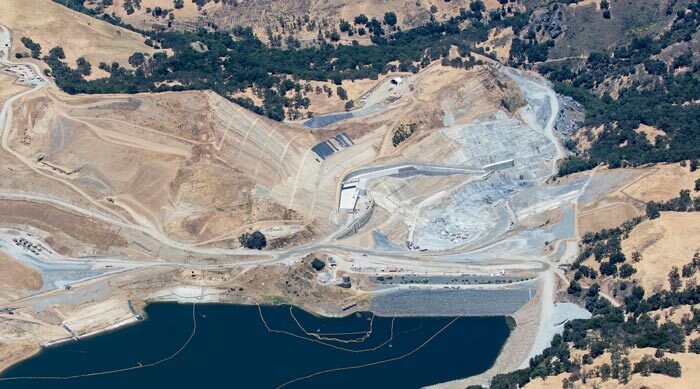 Ultimately, a total of 100,000 working hours went into the construction of the new spillway, and work on the Calaveras Dam Replacement Project is now over 70 percent complete. As for the future dam, construction is expected to begin in October and the project will reach final completion in 2019. Currently, crews are hard at work excavating and grouting the dam foundation in order to prepare it for construction. 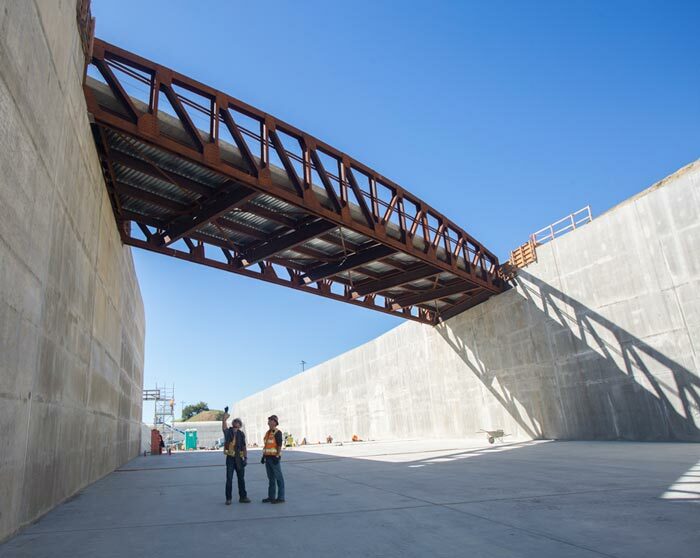 Upon completion, the future dam – including the spillway and outlet works – will be able to withstand a 7.25 magnitude Maximum Credible Earthquake on the Calaveras fault.